September is Whole Grains Month! For good reason, the Whole Grains Council has determined their 2014 theme to be “Make the Switch to Whole Grain”. Whether uninformed, or too busy, many individuals do not incorporate whole grains into their diets. This lack of whole grain consumption could be a contributor to the high obesity rates in children and adults in the United States. If households begin eating less and less refined grains and replace those with more natural whole grains, they will succeed in living longer healthier lives. Swap out one ingredient in your tried and true recipes for a whole grain. Gradually increase your whole grain intake in your diet….You will see and feel the results of this healthier lifestyle. For example, try making barley and meatballs instead of spaghetti and meatballs. Substitute an enriched white flour for a whole grain wheat flour. 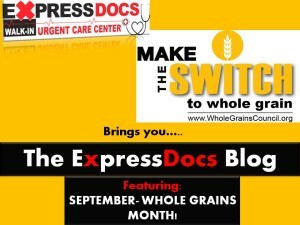 Check out the Whole Grains Council website for recipes with ways to “Make the Switch”! Do you know what foods are considered whole grains? If not, continue reading! ‹ Fruits and Vegetables – More Matters Month!